The defending champions host Josep Gombau’s Adelaide in an exciting preliminary final. Like Friday night’s match between Sydney FC and Melbourne Victory, this is a match between a possession-based team, and a counter-attacking team, and the pattern of the game, particularly considering their previous clashes this season, feels obvious. Adelaide will patiently build attacks from deep positions, with the Mariners looking to counter through their young, pacy forwards. Gombau settled on a starting eleven very early in the season, and there will be few surprises when Adelaide’s side is announced. The only question mark is at right-back, made problematic by the suspension to Tarek Elrich and long-term injury to Michael Marrone – youngster Jordan Elsey started there last week against Newcastle, but remains unproven. It feels far more likely that the return of Jon McKain from injury will allow Osama Malik to shift across to right-back, which, incidentally, makes the probable starting line-up identical to the team from the last clash between these two sides. Phil Moss has far more to consider. First, there was a midweek Asian Champions League match, which he rotated heavily for, but more pertinently, he has a dilemma in terms of shape, after enjoying great success with an unorthodox 5-4-1 against Brisbane Roar last week. After using a 4-2-3-1 for nearly two years, the formation change was completely unexpected – but with Nick Montgomery dropping into the defence to support the centre-backs, it worked a treat against the side most similar to Adelaide in terms of style. It’s not like Moss was preparing for the two consecutive matches against possession-based sides, as up until Richard Garcia’s 90th minute winner against Perth Glory, his side were set to play Sydney – but having seen how effective packing the defence was against Brisbane, he’ll be extremely tempted to return to it (having switched back to the regular 4-2-3-1 midweek against Seoul). The most pleasing element of the 5-4-1 was how it freed up the centre-backs to move out from the back and pressure attackers from behind – Eddy Bosnar, in particular, benefitted from the cover of both Montgomery and Zac Anderson, and stuck tight to Dimitri Petratos whenever the forward moved into a pocket of space in front of him. Likewise with Montgomery, who practically man-marked Besart Berisha, making sure the Albanian couldn’t turn on the ball in the attacking third. The caveat, however, was the Mariners reliance on effective counter-attacking – and with very few forays into Brisbane’s penalty area, their chance conversion was remarkably efficient, and as discussed here, probably unsustainable over a long period of time. It’s simply unrealistic to expect forwards to be so clinical in front of goal, and the nature of their second goal (Anthony Caceres’ long range strike) demonstrated how they were more reliant on taking early chances, rather than consistent attacking. That will be Moss’s biggest quandary. Does he effectively sacrifice some of his attacking threat for the cover of an extra defender? He’ll almost certainly use the quick wide pairing of Nick Fitzgerald and Bernie Ibini – it’s a question of whether he gives them a playmaker in support. That ultimately depends on how he feels his side can cope with Adelaide’s attacking threat. We know how Gombau’s side will play – they’ll work the ball from the back of defence wide, looking to get Fabio Ferriera and Cirio in 1v1s in wide areas, hopefully to be able to cross or cut balls back towards the penalty area. Moss will have been encouraged by how the 5-4-1 meant the full-backs didn’t have to get forward as much (partly, too, because of how few numbers the Mariners committed to their counter-attacks), which, in the context of Adelaide, means Josh Rose and Storm Roux can ‘stay at home’ against Ferriera and Cirio. Having seen Ferriera expose Rose in behind in the 4-0 earlier this season, this will be a big concern – the Portuguese has been in fine form this season with nine goals and five assists. Having five at the back would allow Bosnar to move out to the channels in support of Rose up against Ferriera, and likewise for Anderson with Roux for Cirio. Secondly, Moss will want to prevent passes into Bruce Djite – the striker has adapted excellently to Gombau’s possession game, learning to use his bulky frame to hold up the ball, play with his back to goal and invite runners in behind him. Bosnar tried to stick tight to him in the 2-0 but was exposed by runners in behind (particularly Ferriera), and that, again, is another indictment for the 5-4-1. However, the third thing Moss must consider is how he can nullify playmaker Marcelo Carrusca, who starts at the tip of the midfield triangle but drifts towards the channels to find space. Against a lone holding midfielder, like against Sydney, he’s excellent, constantly finding freedom to either side of the opposition marker – but he seems to struggle more against 2-man midfields, provided they narrow the space between their lines. That’s something Montgomery and John Hutchinson do excellently in the 4-2-3-1. 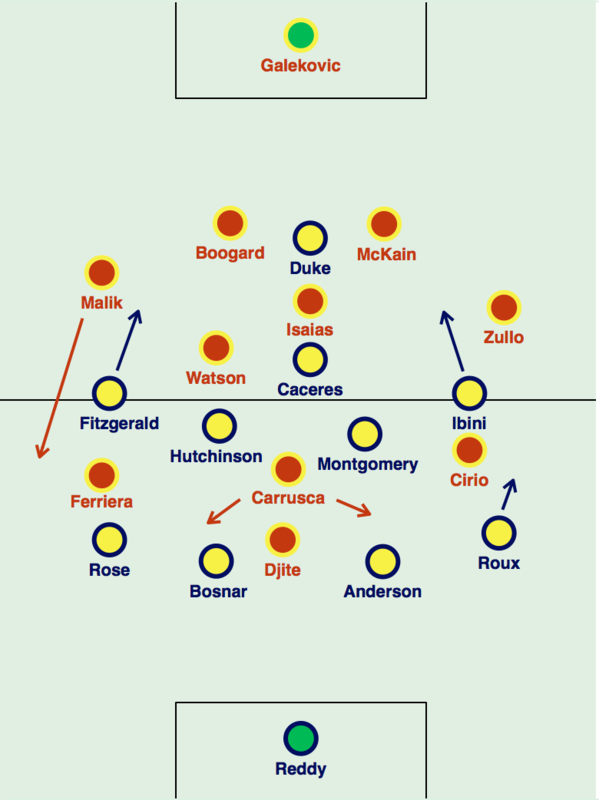 Hutchinson didn’t start in the Brisbane game, but he’ll almost definitely return here regardless of Moss’s choice of formation, because it was in that midfield zone the Mariners looked most weak against the Roar. Caceres and Glen Trifiro were vulnerable to being dragged out of position by the rotation of Brisbane midfielders through that zone, and when they played quick, vertical football, the defence were left exposed – something Adelaide are certainly capable of, as the front four aren’t afraid to attack quickly if the ball is turned over high up the pitch (see their goals against Sydney FC). Hutchinson will bring a stronger defensive presence to that zone, and because the Mariners should have slightly more possession here than they did against Brisbane, will drop between the two centre-backs to facilitate passing moves. Higher up the pitch, Moss instructed Mitch Duke to occupy Luke Brattan when the Mariners were defending against Brisbane, and seeing as Isaias is a very similar type of player – a deep-lying midfielder who works the width of the channel in front of the centre-backs, recycling possession with short and long passing – he’ll presumably give similar instructions to him, provided he starts with the 5-4-1. If he, however, switches to 4-2-3-1, that responsibility will probably fall to the front two, who will drop back without the ball to make the side compact and prevent passes being played into midfield. In the 2-0, Isaias’s response to this was to drop between his centre-backs to create a 3v2 advantage in that zone, a movement which largely went untracked – he promptly hit some dangerous balls forward into attack, and the Mariners must be wary of how he can set the tempo with his excellent range of passing. Furthermore, Adelaide’s centre-backs have matured in terms of their passing this season, learning to take responsibility when the opposition press through midfield by moving forward on the ball from deep positions. That’s a quality Matt Smith and Jade North probably lacked last Saturday, and there’s more risk here of Adelaide circumventing the Mariners deep defensive shape with a high-quality ball from the back. It’s worth noting, too, that should Moss use the 4-2-3-1, the identity of the central attacker isn’t exactly clear. Caceres is the choice based on form, but Kim Seung-Yong is the more ‘natural’ fit, while Mile Sterjovski has occasionally been favoured in that role. Kim started midweek in the Champions League and Moss seems to prefer youthful energy, so Caceres seems likely – he also gives him the flexibility to drop into midfield and introduce an extra attacker if the Mariners are chasing the game. Regardless of who it is, Isaias likes to stick tight to opposition playmakers, so he’s not a positionally disciplined holding midfielder, but instead, harasses players away from goal. Finally, upfront – Mitch Duke will battle in the air against Nigel Boogard but also work the channels with his pace, as well as dropping deep to receive possession and allow the wide players inside on the diagonal. 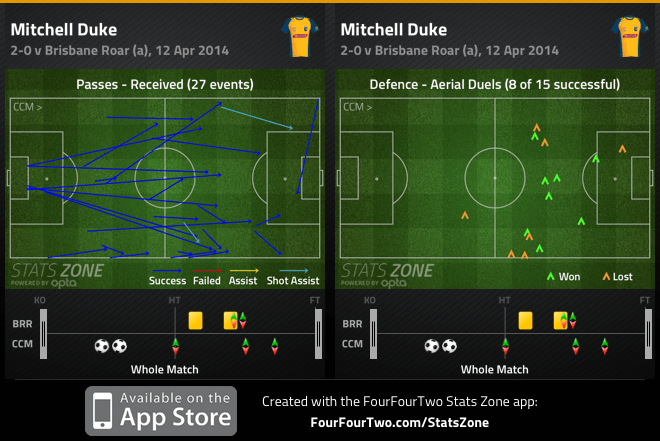 He cleverly worked the space behind Michael Zullo in a 1-0 Mariners win very early in the season, and given the way his side ruthlessly exploited Brisbane’s full-backs on the counter-attack, expect that to be the zone they target on the break. The counter-effect of the advanced full-backs, however, is that it allows Adelaide to build moves into the final third, often because they pass the ball out wide and find space for those players to move forward into. That was particularly evident in the previous fixture between these sides, where Malik, at right-back, constantly got forward and allowed Ferriera high up the pitch – combining with Cameron Watson to create neat triangles down the side. As a defensive midfielder turned centre-back turned sometime full-back, you’d expect Malik to be fairly cautious – but a bit like Sebastian Ryall, he’s learnt the responsibilities of his role and adapted his game as such. In fact, one of the lessons from last night’s preliminary final feels particularly pertinent here – does the full-back’s contribution in attack compensate for the defensive weakness created? With Zullo also going to push forward from the left, it’s an interesting dilemma, and a facet of the game that should be particularly crucial here. From a Mariners point of view, if Moss chooses the 4-2-3-1, they’ll get joy out of bringing the wide players narrow, and creating space for the full-backs to overlap: that lead to their best chances in the 2-0, and has been a standard feature of their play during the Graham Arnold era. Also important to consider is the distribution of either goalkeeper. Both have become adept at the ‘Matt Ryan dropkick‘ – a long, flat pass to spark a counter-attack. Eugene Galekovic is stronger at it than Liam Reddy, which is ironic considering Ryan, of course, was a Mariners player. The natural role of the two goalkeepers will also be important. Reddy has revived his career this season as a fine shot-stopper, and will have to deal with more penalty-box action because his side defend deep, while Galekovic will be required to sweep up in behind his back four’s high line – particularly important because of how quick the Mariners front three will be. The Mariners extra workload because of continental commitments, like with the Victory last night, must also be remembered – the Mariners haven’t been able to rotate as much as some of the other sides, and could struggle towards the end of the match, while Adelaide have had the benefit of eight days rest since their last match. On that note, substitutions could be pivotal. Gombau has the frighteningly quick (and raw) Awer Mabil to turn to from the bench, and also experimented with a 3-4-3 when chasing the game against Newcastle last week, which saw Jeronimo Neumann playing close to Djite. He’s not an overly ‘tactical’ manager, but has more cards up his sleeve than Moss, who has fairly obvious replacements from his bench in Matt Simon, Sterjovski and, depending on who starts, one of Hutchinson, Caceres or Trifiro. 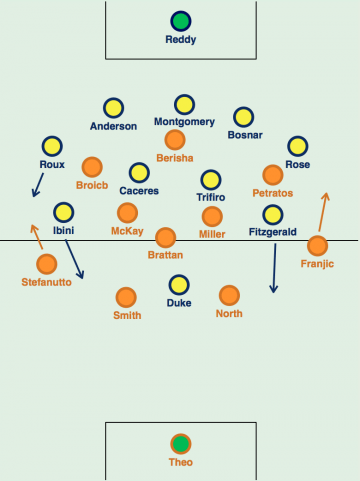 The bulk of this analysis has focused upon the Mariners, because it is their formation that will shape the pattern of the match. We know both the approach of both of these sides, and Gombau has been nothing but consistent in his selection and philosophy this season. The main tactical interest lies with Phil Moss, and whether he chooses to supplement his defence or attack with a supporting player. The win against Brisbane threw the ultimate spanner in the works. It suggested a 5-4-1 is the best way to counter a possession based side, but whether Moss has confidence in it to use it again depends on how efficient he believes his players can be on the counter-attack, and whether he thinks is the best way for his side to counter Adelaide’s attacking threat. It’s a particularly perplexing dilemma because of the two-year commitment to 4-2-3-1. If the Mariners had achieved last week’s win against any other type of side, we probably wouldn’t be having this debate – but it does create a fascinating context to what is already an intriguing match.